I received a DeskCycle to try in exchange for this review. All comments are my own. Over the past few weeks, I have had the chance to try out the DeskCycle under desk bike. I have toyed with the idea of getting some sort of a cycling product for under my desk, so I jumped at the opportunity to try this out. Note: I am never going to argue that the Desk Cycle counts as a workout. It does not. But does it make sitting at your desk all day slightly less unhealthy? I think so. I am a chronic fidgeter, so for me, this was a different way to add motion to my work day. As expected, the Desk Cycle comes packaged in parts so you have to put it together, but the instructions were easy and also pretty obvious. Put base on. Put pedals on. Set up and start pedaling. It’s also easy to take back apart for ease in moving. It’s quite sturdy when assembled. And it’s heavy! It’s not going anywhere when you pedal. There is no good way to take a picture of your feet pedaling. This thing is great. It uses magnetic resistance, so it’s pretty much silent, which makes it great for using in the office. The pedal motion is incredibly smooth. And the resistance is adjustable. Personally, I like it at a high resistance so I can just pedal slowly. I joked to a coworker that it’s how I power my brain. Very slow pedaling to make the cogs in my head turn. I’m sure you could pedal quickly at a low resistance and high cadence, but that sounds like it would make working a bit more challenging. Though it could be something to occupy you while you’re on a muted conference call. One weird thing I noticed is that using this has really improved my posture. Because of the positioning of the pedals, I can’t slouch while I sit at my desk. The DeskCycle does come with a display so you can see your speed and calorie burn. But even the creators of DeskCycle say it’s not quite accurate. It all depends on what resistance they have the bike set at. But they have a calculator on the website so you can input your resistance and the data from the display to figure out how many calories you’re burning. My opinion on that? Ignore it. Ignore all of the calorie burn calculations. Are you burning more calories than you would be just sitting? Probably. But to me, if you’re calculating your calorie burn, then you’re treating this as a workout. This isn’t a workout. To me, it’s an antidote to the effects of sitting all day. Think of it the same way you would think of a standing desk. You’re working muscles there too, but you wouldn’t consider it a workout or think about how many calories you’ve earned. I’m pretty sure they wouldn’t recommend riding with flip flops. I’m a rebel. What do my coworkers think of the DeskCycle? Well, at first they thought I was insane. (But I’m not sure that’s because I have a bike under my desk. I think that’s just their general opinion.) But now they’re jealous. More than once, I’ve come back from a meeting to find someone pedaling away at my desk while they review a document. The DeskCycle doesn’t have to be used at a desk. For a while, I had it underneath my dining room table, where I often work. I also tried it in front of the tv. (My road bike was on the trainer next to me, mocking me silently.) It was a littler harder to use on the couch, since my couch is pretty deep, but you could make it work if you wanted to. So if you’ve considered some sort of under desk bike to add a bit of movement to your workday, I can’t recommend this enough. The DeskCycle is a great, high quality product. It’s quiet, won’t distract your coworkers, and lets you get a bit of “exercise” while you work. This has been a sponsored review by DeskCycle. All thoughts and opinions are my own. Disclosure: This is not a sponsored post. I pay for my own CoSchedule account, but get a discount for referrals. After seeing numerous bloggers talking about CoSchedule, I decided to check it out. What is CoSchedule? It’s a blogging editorial calendar for WordPress that also schedules your social media posts. I like blog editorial calendars. I like being able to see my blog posts all laid out and being able to drag and drop things as I move them around. I also like calendars because I rarely know what day it is, so it helps me make sure that Workout Wednesday posts actually post on Wednesday and not on Thursday or Tuesday because I’m confused as to the day of the week. I’ve been using a basic calendar plugin for WordPress and it works just fine. But when people started talking about also being able to use CoSchedule for social media, I thought I would check it out. I like to tweet my blog posts twice a day, and I’ve been using a plugin (that I paid for), but it’s not all it’s cracked up to be. If you follow me on Twitter, you may have noticed some annoying blank Tweets. Thanks, plugin that will remain unnamed. CoSchedule has fixed that problem, and the best part is that I can easily customize the tweets for my posts. And if I write a post that I schedule for Wednesday, then want to drag and drop it to Thursday, I can do that and the Tweets go along with it. I played around with using it to tweet my fundraising link because I realized that my Twitter hours are typically during the day and not in the evenings and a lot of my friends visit Twitter in the evenings. So why not share the fundraising with them? As you can see, there is one Pinterest post in red. Unfortunately, during my trial, CoSchedule had to discontinue their Pinterest link. There were just too many failed posts (like that one). But they promise us that they’re working with Pinterest to fix this. I don’t pin all of my posts, but the ability to easily pin the important ones is awesome and I hope that feature comes back soon. I’ve been avoiding creating a Facebook page for my blog because I didn’t want to spend the time posting to it, but I think that CoSchedule may help that. If nothing else, it’s an easy way to get my blog posts shared, and I know that a lot of people prefer to have blog posts show up in their Facebook feed, so it might be time I join this decade. CoSchedule isn’t free. It’s $10 a month, and what I love is that you don’t lock in. Take the 2 week trial, and if you hate it, the end. They don’t take your credit card info until that trial is over. Plus you can cancel at any time. That’s definitely key. So far, I’m really happy with CoSchedule. I blog because I enjoy it. I want to put out a quality product, but I also want to enjoy doing it. I don’t want this to become my job and I certainly don’t want it to feel like work. Being able to easily schedule and see everything on one page has made things so much easier. So check out CoSchedule! If nothing else, give the 14 day trial a spin. It costs you nothing. And who doesn’t like free things? PRO Compression provided me with a pair of calf sleeves for this review through my association with SweatPink. All comments are my own. I am a huge fan of compression wear. I own a pair of (super attractive) compression tights and a number of pairs of compression socks. Unfortunately, a lot of those socks aren’t made for people built like me. I am short. I have short legs. But my calf muscles are huge. They always have been, probably because I spent years walking on my tiptoes. So as I’m trying to size myself for compression socks, I’m always struggling to figure out which measurement is the most important – calf circumference or height? I usually end up falling somewhere between sizes. If I go with the larger size, the socks don’t provide the compression I want. If I go smaller, they are often too short to pull up to the top of my calf. I had never tried calf sleeves, so when this opportunity arose, I figured it was time I try this new-to-me method of compression. I had the same issue in terms of sizing with PRO Compression (falling somewhere between), but I wasn’t as concerned about the sleeves being too small because there wasn’t the foot to get in the way. They arrived just in time for me to put them on after a long run. Let me tell you, my post-long run loungewear is pretty attractive, so you don’t get a full pic, just my relaxing legs. I never have visible swelling after a run, but I can say that after wearing these sleeves, my legs were less sore than I anticipated. And they felt good while I walked around that afternoon. So why choose PRO Compression over other calf sleeves or socks? 2. They always have a super fun Sock of the Month! A new sock designs every month with a discount! Make sure you’re on the email list. 3. One of the few compression socks companies that makes a true graduated compression sock (the ones that work!). 4. They sell direct, what does that mean to you? Bigger discounts and more focus on the customer. Want to try them out? Not sure about spending the money? Well, I have a discount code to share with you. Enter the code PINK at checkout for 40% off. 40%! That’s awesome. I’m probably going to pick up another pair for myself at this price. I know a lot of runners who aren’t sure about the look of compression socks and sleeves and who choose to wear them underneath their pants. That’s fair. Personally, I say rock it. PRO Compression has some great styles. Show off those toned legs you’ve worked so hard to get! Thanks again to PRO Compression for providing me a pair of calf sleeves for review. 4/6/16 – See end of post for an update. 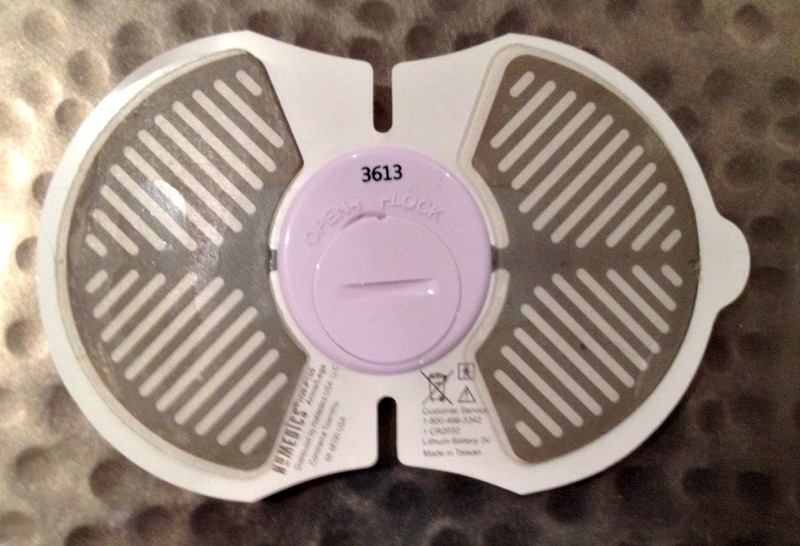 A few months ago, I was sent the HoMedics Rapid Relief Electronic Pain Relief Pads for review. I received the set for Arms and Legs and the set for Lower Back. What is an Electronic Pain Relief Pad? It’s a TENS (Transcutaneous Electrical Nerve Stimulation) device for at home use. Still confused? I was too. So I did some research. TENS is essentially electrical nerve stimulation that can reduce pain. The claims are that it blocks the pain signal from the nerves, though studies aren’t clear on whether or not it actually works. Some studies have shown that it’s not better than placebo. But hey, the placebo effect is a real thing, so I figured I would try it out! The devices came packaged in handy carrying cases to keep the sticky side clean. So how does it work? I stuck it to my calf and pressed the on button. I heard the sound indicating that it was on, but couldn’t feel anything. So I increased the intensity. There are a total of 15 settings. Around level ten, I really started to feel it. It was an interesting pattern of about ten seconds of “buzzing” and then ten seconds of “blips.” For fun, I increased the intensity even more and could see my calf muscle start to twitch. Definitely an electrical current going on there. It automatically shuts off after 20 minutes. So for an athlete’s normal muscle soreness, I’m not sure this helps all that much. It was fun to watch my leg twitch, so if nothing else, it was distracting. If you’ve got some severe post race soreness or a pulled muscle, however, it’s worth a shot. Especially for someone who has thrown out their back. When that happens, you’re willing to try anything, and this is a great non-medical remedy to add to the mix. Okay guys, this thing is officially awesome. I end up with tightness in my shoulders and my lower back and popping the HoMedics Rapid Relief Electronic Pain Relief Pad onto my back definitely helped. It’s now a very valued piece of my health kit. I’m still a fan of heat, but I’ve added this into the mix and am very pleased with the results. Definitely worth it if you tend towards muscle strains.